Northborough-Southborough Youth Lacrosse has taken the lead in Central Mass with a program to have our game fields equiped with AED's. We have received our first donation of an automated external defibrillator (AED) through the work of Dr. Hartigan and the Hospital. Our plan is to raise money and awareness for this critical piece of equipment for our children. The American Heart Association has determined that 250,000 people die each year from cardiac arrest. Ventricular fibrillation (VF) is the most common arrhythmia that causes cardiac arrest. Defibrillation is the only known treatment for VF. It is also the only known treatment for VF caused by commotio cordis. Due to the introduction of a new generation of defibrillators, called automated external defibrillators (AED's), it is possible for lay rescuers to deliver defibrillation. The new AED's are safe, effective, lightweight, low maintenance, easy to use and relatively inexpensive (about $2000). Contact your local American Heart Association to establish a Public Access Defibrillation Program in your community NOW! Commotio cordis will claim more young lives unless we, as parents and educators, do something about it. ITHACA, N.Y. - George Boiardi, a Cornell University senior student, was struck in the chest with a lacrosse ball late in the fourth quarter of a game against Binghamton University on March 17 at Cornell's Schoellkopf Field. He collapsed, and medical personnel tried to revive him on the field. He was rushed to Cayuga Medical Center, where he was pronounced dead at 6:44 p.m.
Boiardi, 22, a history major in the College of Arts and Sciences, was a four-year starter and one of the four captains on the varsity lacrosse team. 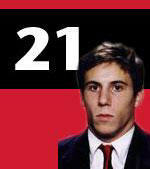 "Cornell's athletics community is absolutely devastated by this tragic loss. George was a terrific person, a great team leader, an excellent student, and in fact he was one of the finest students at the university," said Andy Noel, Cornell director of athletics and physical education. "This loss cannot be measured. Our hearts and prayers go out to George's family, his friends and his teammates." With 2 minutes and 33 seconds remaining in the game, a Binghamton player took a shot on goal, and Boiardi, a defenseman, got in front of the ball to block the shot. Play was halted when Boiardi collapsed, and all the players knelt on the field while medical personnel worked on their teammate. Cornell athletics training staff, two physicians and emergency medical personnel from the Ithaca Fire Department, Cornell Police and Bangs Ambulance attended to Boiardi and tried to resuscitate him with CPR and defibrillation. Play was abandoned, and both teams went back to their locker rooms to await news of Boiardi's condition. The Office of the Dean of Students has been arranging and leading community support groups on campus for teammates, friends and others affected by Boiardi's death. Other support services for students are available through the university's Counseling and Psychological Services (CAPS) at Gannett: Cornell University Health Services and Empathy Assistance and Referral Service (EARS) in Willard Straight Hall on campus. Mario St. George Boiardi was born July 30, 1981. He had a reputation as the fastest player on the men's lacrosse team, and he was named the team's rookie of the year in his freshman collegiate season. He was an 11-time letter winner at the Landon School, Bethesda, Md., a private school near Washington, D.C., where he was an all-league selection as a senior and an all-star pick as a member of the Landon lacrosse team. In addition to earning four letters in lacrosse as a midfielder at Landon, he earned four letters on the school's hockey team and three on the football team. Boiardi was a two-year, all-conference selection in football and the team captain as a senior. The Washington Post named Boiardi to the newspaper's All-Metropolitan football team in 1998 and 1999. He is survived by his parents, Mario and Deborah Boiardi, and two sisters. How can you help? Any donation made to NSYLA is tax deductible, as we are a registered 501(c)3 not-for-profit organization. Simply mark your check for the AED program and it will be used specifically for this equipment. Thank you. We will activate the link below to accept credit card donations soon.